Fiskars Norden premium stainless steel cookware features a rim-to-rim multiply construction that allows the entire surface of the dish to heat evenly. The aluminum core in between outer and inner stainless steel layers guarantees homogenous heating on all hobs. The thick, 3,5mm base distributes heat efficiently. 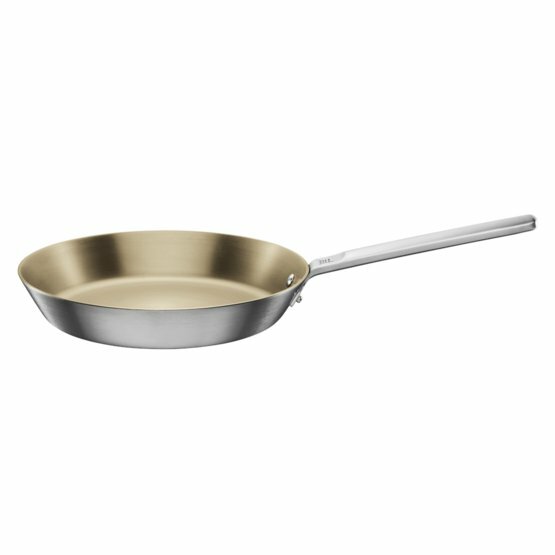 The unique Thermium™ mineral treatment gives the frying pan natural non-stick properties even in very high temperatures without compromising the all steel design of the product. This makes the Norden frying pan perfect for frying even the most delicate ingredients, and allows to bring out the rich flavors in your dish. Handle design minimizes heat transfer for more convenient use.